Swimming, whether it is in a pool, lake or ocean, can be enormously fun, but also extremely dangerous when precautions are not taken. Drowning is the second most common cause of death among children under 14 years old. And it can happen fast - sometimes in less than two minutes after a person's head goes under water. "It is believed that two-thirds of the people who drown are believed never to have had any intention of being in the water," reports the Federal Citizen Information Center (FCIC). Everyone should learn to swim - you never know when you will need to save yourself or someone else in the water. However, enrolling young children, under the age of four, into formal lessons, is not necessary. They should be at least four years old for formal lessons. "At this age, children aren't old enough to learn water safety, or how to react in an emergency situation," reports Caring for Kids. But these youngsters should be involved in organised water activities to help them build confidence and teach them about water safety. "Lessons won't make your child drown-proof, but they will increase their safety and prepare them for a lifetime of fun in the water," reports the FCIC. While backyard pools provide great relief on a hot summer's day, those very sources of enjoyment are the number one place for toddler drownings, according to the Canadian Red Cross. Children must never be allowed unsupervised access to a pool. A fence should surround the pool, and be equipped with a latch that cannot be reached/opened by a child. When a child is in the pool, an adult should never go beyond the deck and must always watch the child. Enforce rules of conduct while at the pool including, no running or messing around on the deck "many drownings and near drownings occur when a kid accidentally falls into a swimming pool," reports Kids Health for Kids. As well, diving should only occur from the diving board - the water may be more shallow than it appears from the surface. Young/weak swimmers should wear a floatation device, like a life jacket or water wings, while in and around the pool. These same swimmers should remain in the shallow end. A day at the beach is always a lot of fun. But open waters - lakes, ponds and oceans, come with their own dangers. Open waters are not always clear - many have jagged rocks, broken bottles and trash at the bottom, which is why it's a good idea to wear water shoes. Also, watch out for weeds and grass, which can trap even a good swimmer. "If you panic and try to yank yourself free, you may get even more tangled," according to Kids Health. "Instead, shake and pull your arms and legs slowly to work yourself loose." Strong undertows, ocean currents or rip currents can make a day at the ocean very dangerous. Rip currents, in particular, can carry swimmers away from shore in a matter of seconds. If you find yourself caught in a current, swim parallel/alongside the shore until the water stops pulling you. Oceans are a wonderful place to swim with sea creatures, however, some fish are not too pleased when happy swimmers accidentally invade their space. In particular, jellyfish and Portuguese man-of-wars can often be found floating near the shore. A sting from these umbrella-shaped, nearly clear creatures can hurt and blister the skin. This is another good reason to wear water shoes. As with swimming in a pool - obey the rules. If a location is not open to swimmers, do not swim there. 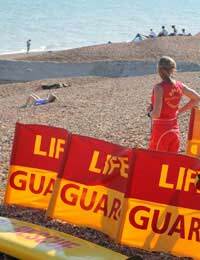 Ensure there is a lifeguard present; don't swim too close to piers; face the wave - so you know what is coming; never fake a drowning; and make sure you can always see the people on shore. "If you can't see them, that means they can't see you," according to the Public Health Agency of Canada. Water parks provide a thrilling way to enjoy the water - wave pools, slides and rides. However, before hopping on the ride, know what it entails. This will help ensure fun and safety. Read all the signs posted at each ride and make sure you meet all of the height and age requirements. Also check that you do not suffer from any of its listed medical conditions. Other safety precautions include ensuring a lifeguard is at every ride and go down a water slide as directed - face up and feet first.